If you love Jane Austen you need to move this book up to the top of your TBR list immediately! Sophie Collingwood’s uncle has just died under questionable circumstances and then his prized rare book collection has been sold to satisfy his debts. To console herself, Sophie goes to work at her favorite bookstore in London, Antiquarian Books. While working at the store, she is approached by two different collectors who are after the same book, Little Book of Allegories, written by Reverend Richard Mansfield in 1796. What are the odds that two people would be looking for this same book at the same time? Unlikely to say the least. Soon Sophie finds herself entangled in a dark mystery that suggests Jane Austen actually plagiarized her most well known novel, Pride and Prejudice. The Reverend Richard Mansfield and Jane Austen spend a great deal of time in conversation while she is writing what would be her first novel, Sense and Sensibility. The novel focuses on the friendship between Mansfield and Austen and how that friendship potentially shaped her writing. What Sophie isn’t prepared for is the fall out….the closer she gets to unlocking the mystery, the more her life is in danger. Earlier this year I read another book by Lovett, The Bookman’s Tale, and was turned on to a new sub genre for me….literary thrillers. And that’s what this book was written for…..bibliophiles. The suggestion that Pride and Prejudice could have been plagiarized is compelling and seductive, not to mention controversial. Lovett makes no claims that this book is historically accurate, but he approaches it in a way that is more suggestive….more of a ‘what if’. I think you have to approach this novel with an open mind. It’s historical fiction….sure there are real life people cast as characters but it’s not meant to be a historically accurate novel. Jane Austen is meant to be a ‘fictional’ character in this book so if you look at it that way and just enjoy the story without reading too much into it….then I think you will love this novel. This book has a lot for book lovers to swoon over. What book lover doesn’t dream of going to work in a rare bookstore and having all that rich literary history at their finger tips? I for one was like where do I sign up for this dream job? And then to be thrust into this literary mystery…..swoon swoon and more swooning! 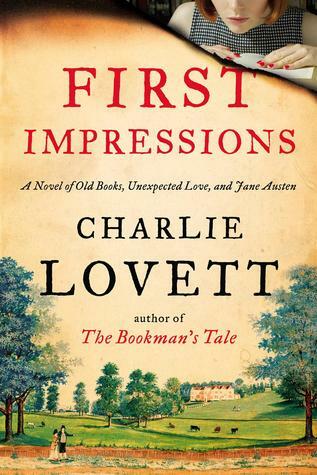 One of the things that stood out to me in this novel was, again, Lovett’s extensive experience with book collectors and antiquarian bookshops. This is clearly an industry that he has extensive knowledge about. As with his previous novel that I read….I would recommend this book based on the antiquarian book knowledge alone! It’s so extensive and all encompassing but presented in an understandable fashion that readers will be completely bewitched! The dual story lines also worked well for me. There were some parallels with in the past and present portions that I thought were intriguing and added some foreshadowing throughout the story. As for the characters, Jane is appropriately cast. She was intelligent and was humorous with a strong moral compass which was exactly what I envision Jane Austen as: charming, witty, and wholesome. I thought Lovett appropriately cast her and I think other readers will feel the same. My only complaint was Sophie. I think sometimes she made strange choices and she seemed a little overly paranoid for my taste. I thought she jumped to a lot of conclusions and that bothered me. There were a few too many ‘coincidences’ for me in her narrative and though I could relate to her as a character, I didn’t completely commit to her overall story. On the whole, it was a decent read. I can’t say that I liked one book better than the other, I liked them both pretty well but for different reasons. I think this book will appeal to a female audience a little more than The Bookman’s Tale….that book would probably interest both male and female audiences. Bottom line if you love old books, rare antiquarian bookstores, mystery, a little romance, and Jane Austen then you will enjoy this book.